Definitely one of the leading online binary options brokers, Exciting Markets provides its users with the most advanced features that turn trading into a simpler and better way to grow your money. It offers some of the industry’s innovative widgets and other trading accessible tools. This binary options broker allows traders to enjoy trading among its various assets available. Currently, there are 11 currency pairs, 6 commodities, 10 indices, and 20 stocks open for trading. ExcitingMarkets features some of the most famous stocks, such as stocks from Facebook, Sony, Microsoft, and Apple among others. Moreover, this platform presents three account types to choose from. Each type gives a specific set of benefits and it is up to the user to select that which best serves his interests. These types are the Classic, Gold, and Infinity account. The Classic account serves as the entry account. With this account, traders can get a 20% bonus upon depositing a certain amount. On the other hand, the Gold account offers 40% bonus, slightly lower than the Infinity account’s 50% deposit bonus. All account types come with a free personalized coaching, training and learning tools. 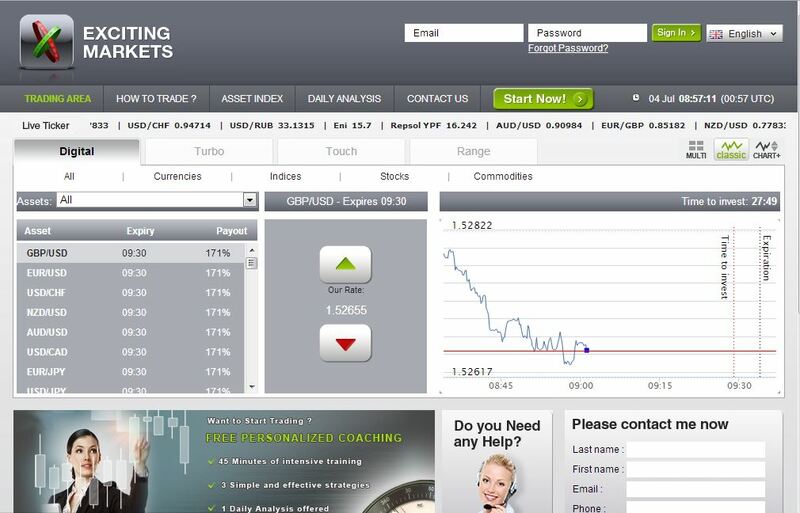 Exciting Markets review offers a number of helpful features such as its Daily Market Review widget. This accessible tool gives traders an idea of the present trends in major currency pairs. Using the Daily Market Review, traders can base their options on their synoptic view of the market’s movements. This widget also gives notes to help traders understand the data on the charts. Aside from this remarkable feature, ExcitingMarkets also utilizes some of the standard trade types. These include the Digital High/Low, Range, Touch, and 60 Seconds. Through these trade types, any type of user, be it a novice or an expert, can easily trade various assets.